I thought the Piano Rehearsal was going to be the WB release, this year, and Tidal was releasing something newer, next year. it is. it's just confusing because there's no mention of WB in any of the official info. or am i going blind and have i missed it in all the news items? I posted a link to Warner Bros. Germany's official announcement. And several other media links. 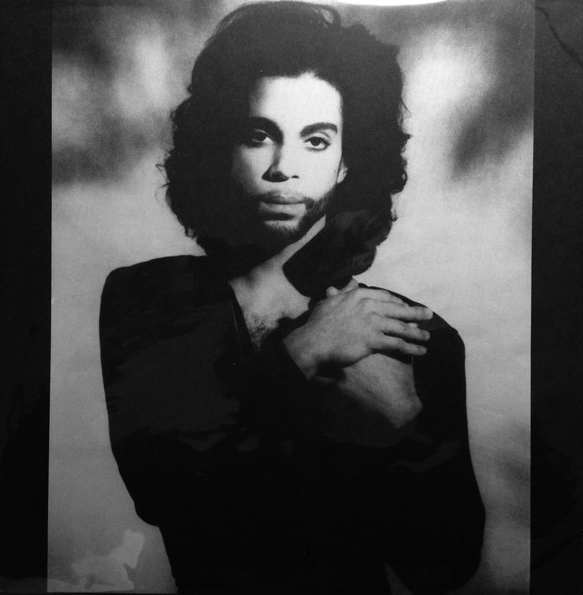 This raw and intimate recording, which was written on the eve of his world career just before he became an international star, resembles the format of the 'Piano & A Microphone Tour', which ended his career in 2016," explains the Entertainment Advisor to the Prince Estates, Troy Carter . "The Estate is very happy to give the fans a taste of Prince's evolution as a world star and to show how the circle of his career ultimately closed with the tour on the piano." The Deluxe CD+LP format will include a 12” booklet featuring brand new liner notes written by Prince’s then engineer Don Batts, as well as candid shots of Prince including never before seen images. Hmmm, let's hope the other releases have those liner notes as well. So... This means the Tidal 2019 release is Piano & Microphone 2016, right? They do not mention the exact address it was recorded. They do not mention uncirculating. They do not mention mastering chain nor mastering engineer. Stuff like this has been out for decades. If they did a release like this every month (with at leasrt 45+ minutes of music instead of 35!) i'd complain less. But with the track record so far I'd not hold my breath for a followup release. This September 21st, the timeless Prince back catalogue welcomes a new, special addition - ‘Piano & A Microphone 1983’: 9 tracks and 35 minutes of pure Prince, simply sitting at a piano and playing. The private rehearsal recording, captured at Prince’s home studio in Chanhassen, Minnesota, provides a rare, intimate glimpse into the iconic artist's creative process as he works through songs including “17 Days,” “Purple Rain,” “Strange Relationship,” and “International Lover”. As ever, I will buy it because it's P, even if I have "Eavensdropped In Intimate Moments" from nearly 30 years ago. Anyway, given "the myth" of the Vault (and also the number of unreleased songs and albums we already have as bootleg) I was expecting something more exciting to be released than a home piano rehearsal. I also doubt it will rise great interest outside of our P fams. It is not something the common audience can really appreciate and be attracted to, in my opinion. - why not give the CD a booklet like the deluxe thing when the pricing is as it is? Credit where it's due for the rarity aspect but personally there are 1000 other things I'd have liked to have seen before this. I'm more looking forward to the non-WB Tidal release next year..
On a side note, I was hoping the studio version of "Nothing Compares 2 U" was to be included on the WB september release. Welp, now we get to wait even longer until more studio material comes out. I can't lie, I'm very underwhelmed and disappointed by this announcement, but oh well. Hopefully everyone else will enjoy it. As cool as this release is it’s still of a bit of a head scratcher...tons of unreleased songs in the vault and they choose this? I think this release have to put on a definitive rest the debate on the fact that bootleggers did crimes releasing all these years songs and tracks P never intend to do. I can see nowhere how P could think of release this piano rehearsal. Grateful for this, but wish they had released P&Microphone 2016. That would probably get more sales other than Prince die hard fans and get his music out there to younger generations, even if on the coattails of all the hype behind his death. i wish the booklet was available with just the CD, and I'm scratching my head as to why they picked this of all things. But! I've probably listened to Mary Don't You Weep 10 times already and love it, and I'm absolutely excited to get anything! I never would have guessed that I'd be buying an official release of this 30 years later – with exactly the same bad sound quality. They are sitting on real treasures. Pristine quality masters of amazing music no-one has ever heard and of course hundreds of songs we grew to love as lo-fi bootlegs. Yet, 2.5 years after his death, they chose to re-release a 35 minute bootleg that not even us diehard fans were ever too excited about. This is what Warners have chosen to kickoff a hopefully long series of vault releases by Prince. I'm honestly struggling to find the words... 'Ridiculous' and 'disaster' are understatements. I'LL TAKE IT!! And I'm glad to have it. I'm not complaining. The more of his older and rare material we can get the better. I miss Prince and I miss being excited about getting new Prince albums. I'm glad to see his estate, Warner and even Tidal have found a way to work together. Does anyone know who has the tapes from the vault now? Last I heard they were taken from Paisley Park. "I know I hold you too tight, but I just can't seem to get close enough." The vinyl I linked to was NOT good quality... no where near as good as this single that just came out. Granted, this set has been rehashed on many boots, some with much better quality, maybe even as good as this official release. But not the one I linked to. It sounds bad. Right now I wouldn't be too surprised, if the 2019 release turned out to be The Undertaker from '93. Or the early Emanicipation-configuration that we all know as Sabotage's "Emancipation, The Secret Chapter". With a biiiig booklet of course (including previously unseen pictures!!!). I'm willing 2 do the work. Amazon says "under exclusive license to Warner Bros." Tidal has it, but so do all the other services. This is the Warner album--the Tidal one is something else. I'm good with this and look forward to having it! I think the choice makes perfect sense as a ramp-up for an upcoming Piano & A Microphone 2016 release. 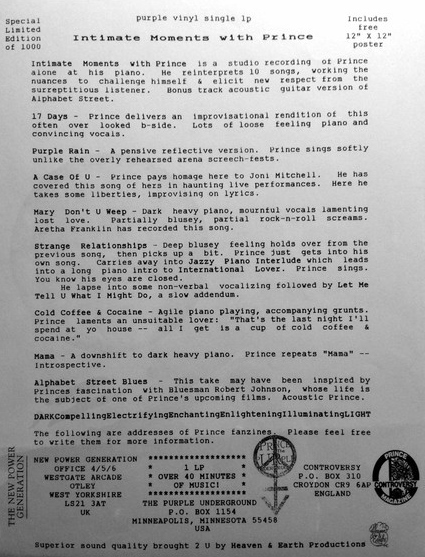 This is the kind of stuff I want to see released from the vault - cohesive collections that show Prince's genius. While I'd generally prefer full band recordings to solo piano, I prefer this cohesive release to a random selection of unreleased songs.